This event took place at 06:30PM on 10th January 2018. He’s the man that delivered Brexit and one of the most talked about politicians in the country. 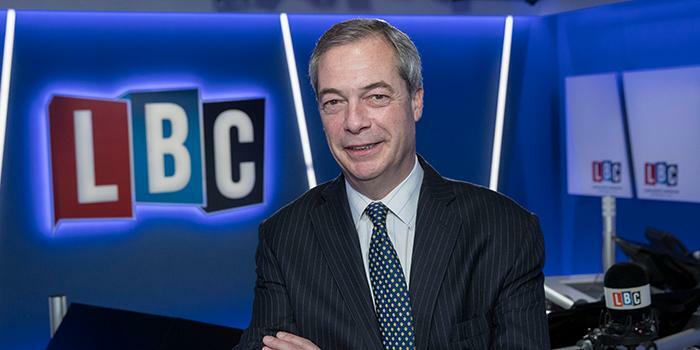 Now you can see, LBC’s Nigel Farage, live on stage on Wednesday 10th January, at the Hippodrome Casino in London. Nigel will tell all on his relationship with Donald Trump, the inside story of the night of the Referendum and what he really thinks of Jean-Claude Juncker. The intimate event is in aid of LBC’s charity Global’s Make Some Noise. Select the meet and greet option for the chance to enjoy booth seating, meet the presenter after the show, have your photo taken and receive an exclusive signed poster.